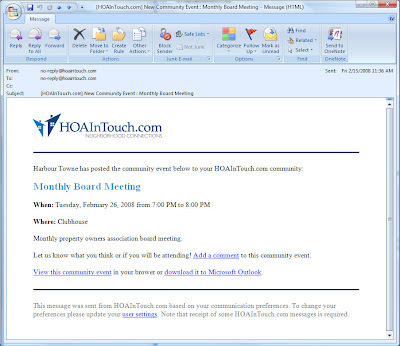 Today I would like to take a few minutes and examine the Community Events feature of HOAInTouch.com. 2. Rained on, become illegible and look terrible. Even if someone was able to read the flyer they rarely remembered to write it down once they made it back inside. Bottom line is the flyers weren't an effective tool in informing the neighborhood or getting the community engaged. With these challenges in mind we went to work creating the Community Events feature. As always, our goal was to create a system that was simple and intuitive enough for anyone to use but useful enough to fulfill the goal of informing the neighborhood and increasing participation. When you view the dashboard for your community the next five community events are listed on the right hand side. You can also click the Calendar tab at the top of the page to view your upcoming community events. From the calendar screen only the name of the event, location and partial description are visible. To view the event details user’s can either click the name of the event or the details link at the bottom. In the event details page users are able to view all of the event information (event name, start date/time, end date/time, location and description), as well as add a comment (a great way to RSVP) or download the event to their local calendaring application (i.e. Microsoft Outlook) and set a reminder. 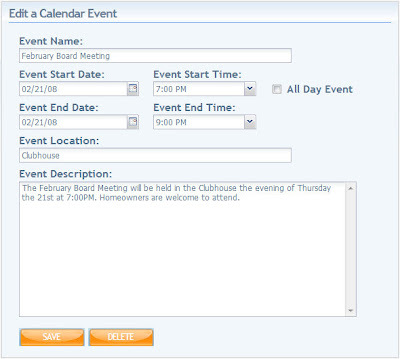 Adding an event is super simple and is much like adding an event to Microsoft Outlook or other calendaring application. Simply enter the name of the event, the start date / time, the end date / time, the location of the event and a short description. If it is an all day event (i.e. a holiday, garage sale, trash pickup, etc.) simply check the Add Day Event box. 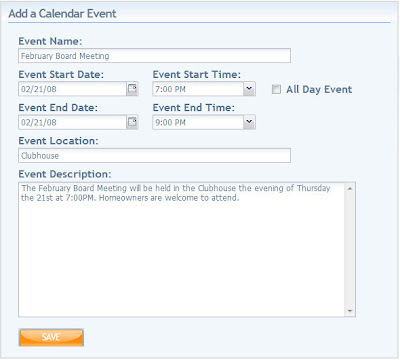 If the user is authorized to edit an event, an edit link provided below the event description on the Calendar page. The edit event page is almost exactly the same as the Add Event page with the exception of a Delete button. To delete the event simply click the Delete button and then click Yes when asked to confirm. When a community event is added to the system an email is sent to all users in the neighborhood that are subscribed to receive updates. This is a great feature because it enables users to stay informed without having to constantly remember to check the website. Instead they stay informed simply by checking their email – just like they already do every day. By making it so easy for residents to stay in touch with the community you can increase community participation dramatically. Really that is what HOAInTouch.com is all about. Leveraging technology to increase communication and build a sense community in your neighborhood.